Live CFL on TSN broadcasts are anchored by the network’s decorated broadcast team, featuring play-by-play announcers Chris Cuthbert, Rod Black, and Gord Miller, alongside game analysts Glen Suitor, Duane Forde, and Matt Dunigan. Once again, CFL on TSN broadcasts include Brian Williams as he brings fans in-depth features and interviews with key newsmakers, while TSN Football Insider Dave Naylor and TSN Football Expert Farhan Lalji break down the hot button issues impacting the league across TSN platforms. CFL ON TSN’s Kate McKenna and Derek Taylor also provide frequent contributions throughout the season. | For a full listing of TSN Channels and how you can watch the game in your region, click here. RDS, diffuseur francophone exclusif de la Ligue canadienne de football (LCF) et des Alouettes de Montréal, offre aux amateurs une expérience du football canadien complète pour la saison 2018, incluant la diffusion de plus de 50 matchs. En plus de présenter les 18 matchs des Alouettes de Montréal, RDS diffuse 16 rencontres du ROUGE et NOIR d’Ottawa ainsi qu’une douzaine d’autres matchs de saison régulière. À cela s’ajoute la diffusion de tous les matchs des éliminatoires, incluant la 106e Coupe Grey, présentée par Shaw. Une émission d’avant-match de 30 minutes précédera chacune des parties des Alouettes. Based on a multi-year agreement with the CFL, ESPN and ESPN+ have exclusive rights to present all regular season and postseason CFL games in the United States, including both the Eastern and Western Semi-Finals, as well as the 106th Grey Cup presented by Shaw. Production and commentator teams for ESPN telecasts are from TSN, Canada’s Sports Leader. ESPN International and its affiliated networks also distribute CFL games internationally to more than 47 million households and 74 countries. | For ESPN+ schedule click here | How does ESPN+ work? Thu, June 14 8:30 p.m.
Fri, June 15 9 p.m. Sat, June 16 7 p.m. Sat, June 16 10 p.m.
Fri, June 22 7 p.m.
Fri, June 29 7 p.m.
Fri, June 29 10 p.m.
Fri, July 13 9 p.m. Sat, July 21 9 p.m. Sat, July 28 4 p.m.
Thu, Aug 2 7 p.m.
Fri, Aug 3 7:30 p.m.
Thu, Aug 9 10 p.m. Sat, Aug 18 9 p.m.
Sun, Sept 30 1 p.m.
Sun, Oct 28 1 p.m.
Sun, Nov 11 1 p.m.
Sun, Nov 11 4:30 p.m.
Sun, Nov 18 1 p.m.
Sun, Nov 18 4:30 p.m.
Sun, Nov 25 6 p.m.
Sports fans in the United Kingdom and Ireland will have the opportunity to watch CFL action live on television for the fourth consecutive season. BT Sport will broadcast CFL games live starting with the regular season opener on June 14. BT Sport is available to more than 5 million homes across the United Kingdom and Ireland. Today’s news follows a multi-territory agreement between the CFL and ESPN Inc.
All CFL pre-season, regular season and playoff games will be available on Sirius XM. For a complete list of stations to tune in, please click here. Below is a list of CFL home radio partners that provide exclusive broadcasts of CFL games. Every regular and post-season game, including the 106th Grey Cup presented by Shaw in Edmonton, will be available live to SiriusXM satellite and online subscribers on Canada Talks (channel 167). French-language broadcasts of Montréal Alouettes and Ottawa REDBLACKS games can be heard on Influence Franco (XM 174). Click here for a complete listing of broadcast games and SiriusXM Channels. Every game of the 2018 Season – including the CFL Semi-Finals, Finals and the 106th Grey Cup presented by Shaw is available for viewing world-wide in over 100 countries! 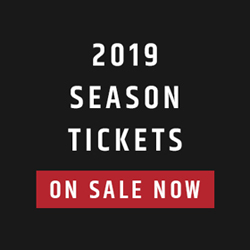 Purchase a regular season package for $79.99 (includes the 81 regular season games LIVE and ON-DEMAND) or a specific team package (includes all home and away games for one team LIVE and ON-DEMAND) in HD for $36.99. 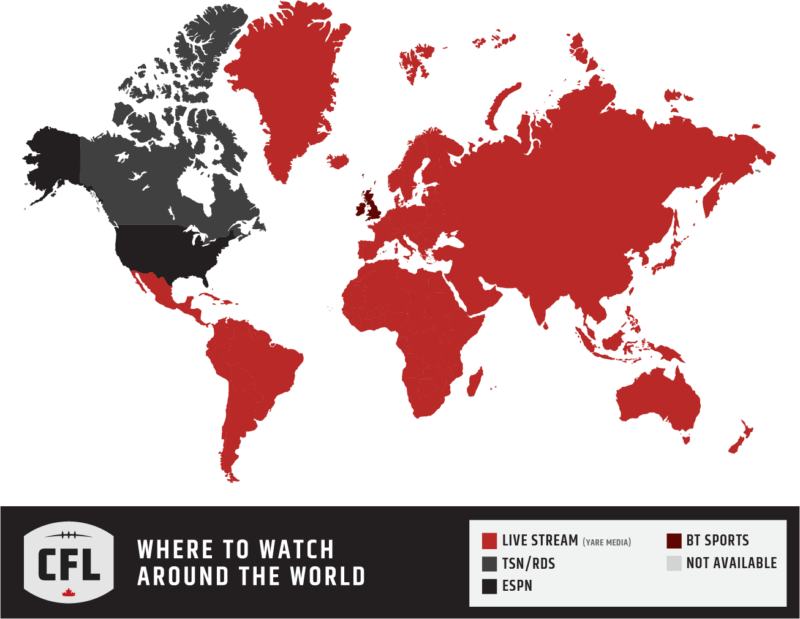 | For more information on international streaming of CFL games, click here.